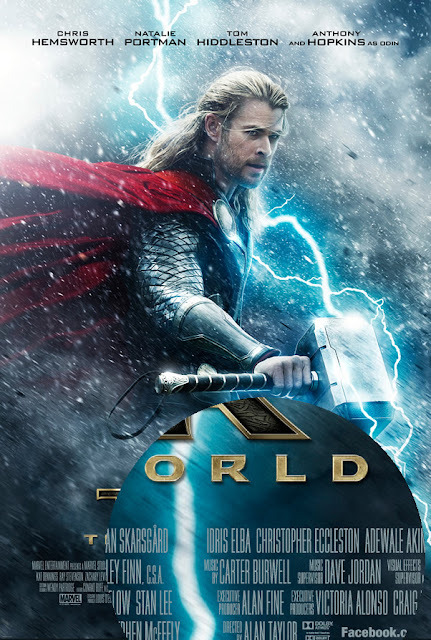 Tracksounds: Composer for Thor - The Dark World Revealed in Teaser Poster! Composer for Thor - The Dark World Revealed in Teaser Poster! Marvel Studios began their press campaign with the release of the first teaser poster for THOR - THE DARK WORLD, the sequel to 2011's THOR. While a host of details for the film were released along with the image (see below), one detail can only be found in closely examining the beautiful poster itself... and that is that none other than composer CARTER BURWELL will be composing the original score! As you'll recall, Patrick Doyle ably composed the score for the first film, directed by Kenneth Branagh, and so with the change in the director's chair, many wondered if Doyle would return. It has been known for some time that veteran, television-director, Alan Taylor (Game of Thrones, Boardwalk Empire, Mad Men, Law & Order, The Sopranos) will be Asgard's true master this time out, but we are now treated to this a-typically, early release of information regarding the original score's composer. For some, is not likely that the superhero genre is what first comes to mind when thinking "Carter Burwell." No doubt, Taylor has an impressive cable-television directorial resume; one that can lead to fans having high expectations in terms of the level of drama and character development, but what does his choice in composers say about the score? Will it be the subtle, yet deep variety commonly coming from Burwell's pen or will he open it up and give us something as adventurous as ROB ROY? Do you think this was a good choice? What does this do to your level of expectation for the film and its score? Tell us in the comments below! “Thor: The Dark World” is presented by Marvel Studios. The executive producers are Alan Fine, Nigel Gostelow, Stan Lee, Louis D’Esposito, Victoria Alonso and Craig Kyle.